Increase fairway widths Fairways were widened by as much as 50%, offering more strategic options in playing holes from tee to green. Removal of rough All rough was eliminated, establishing two heights of grass: greens and everything else. Reintroduction of natural areas 35 acres of irrigated turf were removed, restoring natural areas of sand, wire grass, pine straw and a variety of native grasses. Turf maintenance 650 irrigation heads were eliminated, and the centerline irrigation was restored. Increased length Thirteen new tees were added to the championship course, increasing the total championship length by more than 300 yards, to 7,565 from 7,214. Greens Only two (15 and 17) were modified slightly to increase hole locations. Cart paths Relocated and concrete removed. The second hole remains one of the most difficult on the course. It was one of four par-4s that could play over 500 yards from the back tee during the U.S. Open. The third hole could be set up as a drivable par-4 during the championships. With turf removed from behind the green, approach shots that go over could roll down the hill considerably. Added a championship tee at about 250 yards that was used to make the hole drivable during the U.S. Women’s Open. The back tee, at about 390 yards, was not built during previous U.S. Opens, but it was used during the U.S. Amateur. Changed from a par-5 to a par-4 and will play about 530 yards for the men and about 450 yards for the women. Two new tees left of the previous tee restore original line of play, which moves from right to left. The new back tee is on the backside of the sixth tee. Converted to a par-5, the way it played during the 1936 PGA Championship. Restored the fairway bunker at the start and left of fairway. From the back tee, it is about 290 to 300 yards to carry the fairway bunker. Added sandy wiregrass collection area left of green. The sixth had the fewest changes on the course. The seventh may have had the most significant amount of work of any hole with an expanded fairway, new back tee and sandy rough all down the right side. It will be about a 280- to 300-yard carry the dogleg right. A par-5 for regular play, this will continue to play as a par-4 during the championship. With firm and fast conditions, balls will continue to feed from right to left, bringing the sandy wiregrass into play left of the fairway. A new tee was added that can increase length to about 500 yards. It played as 485 yards in ’05. This hole may represent the most visual of the restoration’s changes, although the hole will play similarly. Sand and wiregrass cover most of the area from tee to green. The longest hole on the course has been extended and will have sandy and wiregrass in play throughout the hole. Brought sandy wiregrass area closer to back of green, so that it will come into play for balls rolling off the green. Ben Hogan called the 11th one of his favorite par-4s, and the hole has been restored to the way it looked and played in his era. A new back tee has added about eight yards, and the tee was slightly raised by about 3 to 4 six feet. 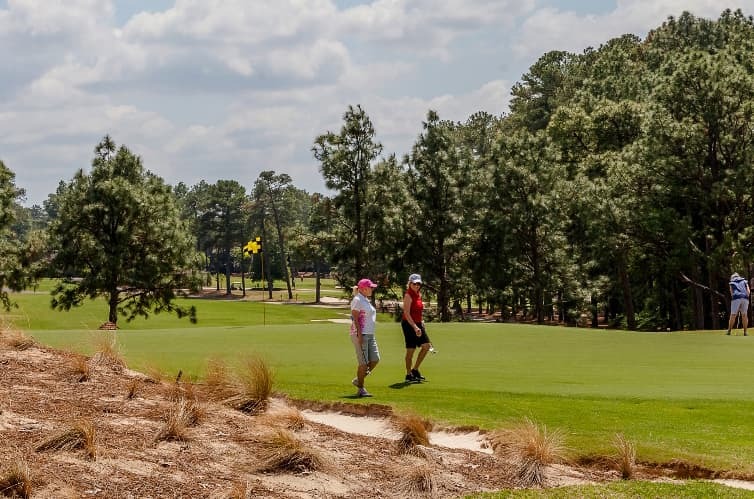 This hole has been lengthened as much as any other on the course, and sand and wiregrass play a strategic role off the tee and around the green. The 13th often plays as one of the more exciting holes on the course. With the back tee, it will demand precise yardages to stay in the fairway. It also may be played as a drivable par-4, bringing sand and wiregrass into play on the left side of the green. The 14th, which plays with the prevailing wind, will play similar to how it has previously, with sand and wiregrass guarding the fairway and green instead of Bermuda grass. New championship tee added about five yards. Restored two right fairway bunkers about 225 yards from green. Both were in original photos of the course. The hole looks significantly different from the tee due to the removal of trees behind the green. One of only two greens that were slightly modified, it has significantly more hole locations. Recaptured middle right hole location by bringing green closer to right greenside bunker. That bunker now runs right up to the green. A par-5 for regular play, this plays as No. 2’s longest par-4 during championships. The 17th has been lengthened and has more hole locations than in previous championships. Ross’ masterpiece concludes with a slight dogleg right that now plays around sand and wiregrass. Where Payne Stewart drove his tee shot in the final round of the ’99 Open would now land in sand and wiregrass.